Undergraduate students from around the nation who may have thought graduate school was out of their reach found out in a one-week summer institute at UNC Charlotte that it is within their grasp. “We have incredible data showing that many of the fellows in our institute seek graduate education. It’s a huge percentage and is so gratifying,” said Steven Rogelberg, co-founder of UNC Charlotte’s Organizational Science Summer Institute. The institute seeks to diversify the field of organizational science through professional development, specifically targeting historically underrepresented undergraduate students. This summer’s 10 students are among the close to 100 scholars who have completed the inclusion-based, research-driven initiative since it began in 2009. Each year, roughly 50 scholars apply. The program has seen measurable success, stated OSSI Faculty Coordinator Enrica Ruggs. During their week at UNC Charlotte, the fellows work with UNC Charlotte student mentors who share their real-world experiences as graduate students. The undergraduates also work with faculty coaches and participate in intensive GRE training, writing exercises, research work, presentation practice and more. “The fellows have several opportunities to get the inside scoop during OSSI that I do not believe can be learned in a classroom,” said graduate fellow mentor Sabrina Speights. Students learn research practices and work on research projects they will continue with faculty members at their home institutions. 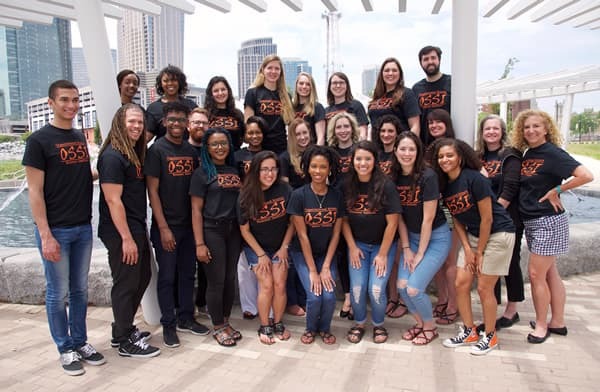 The OSSI program, which is a component of the interdisciplinary Organizational Science program, benefits the UNC Charlotte graduate student mentors, who strengthen their leadership, research and teaching skills as they instruct and advise the undergraduates. Organizers hope the lessons learned will extend well beyond graduate school for the participants, Rogelberg said. Until that day, the UNC Charlotte OSSI will continue to offer underrepresented undergraduates additional tools to help them succeed.